We’re jumping over a lazy dog to get to Montblanc Red Fox. 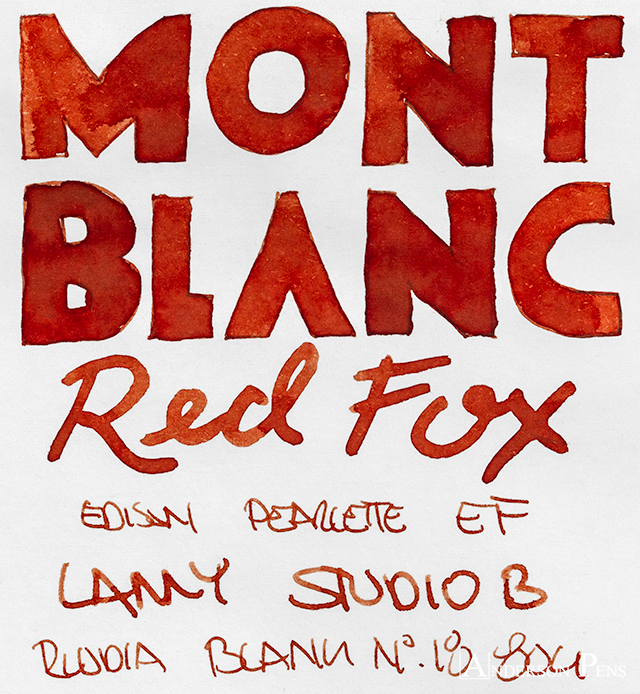 Montblanc Red Fox ink was released in conjunction with the Le Petit Prince series of pens. 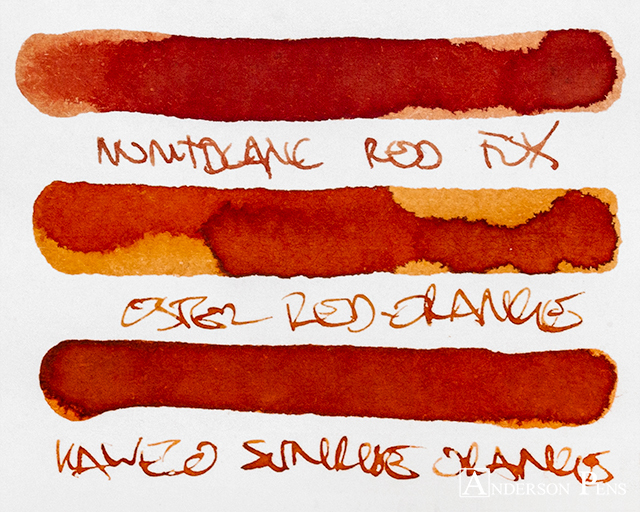 The ink is a rusty red that has a classic look to it. 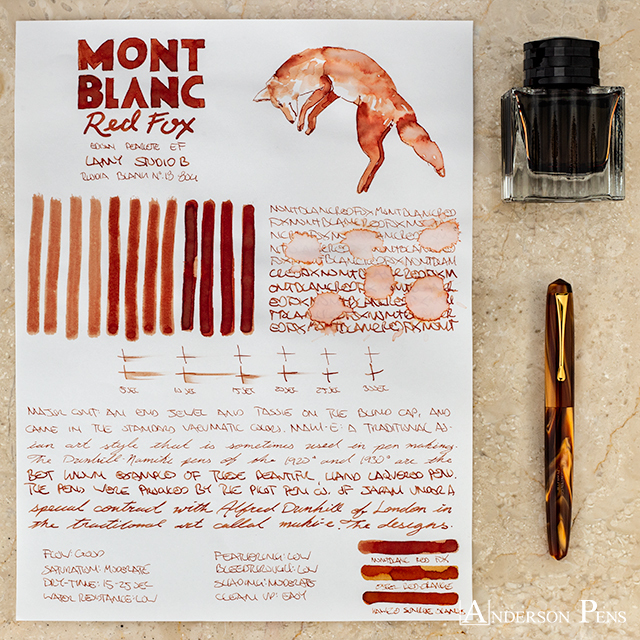 Red Fox comes in Montblanc’s 50ml square glass bottle. Besides the bottle being one of the best looking on the market, the outer box is very well done. This review was done with an Edison Pearlette EF, Lamy Studio B, and on Rhodia blank No. 18 paper. 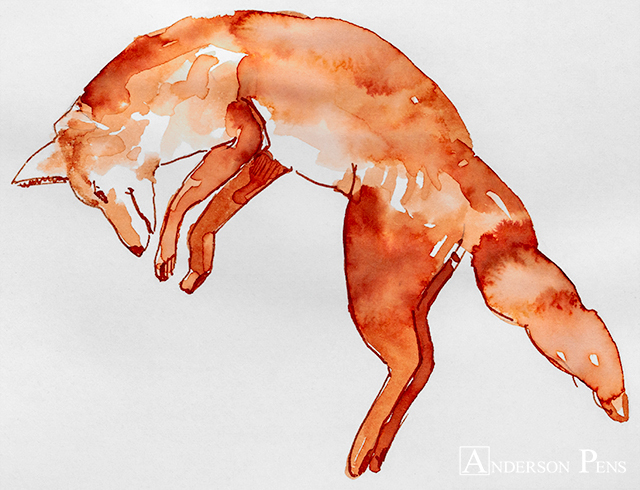 Red Fox rides a fine line between red and orange. While red is in the name, I would say the ink leans closer to orange. At its lightest, the ink is a mellow ginger color. From there, it shades to bronze and rust hues. 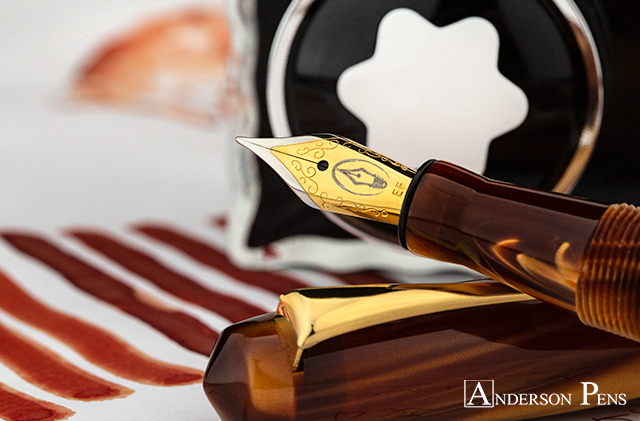 The darkest the ink gets is a rich amber that appears very earthy. The ink is matte on the page and does not have any sheen. 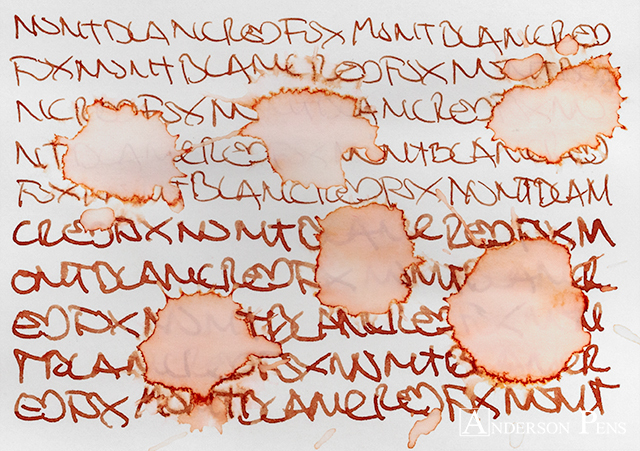 Montblanc inks usually behave well and Red Fox is no exception. The ink has good flow, with no feathering or bleedthrough on Rhodia paper. 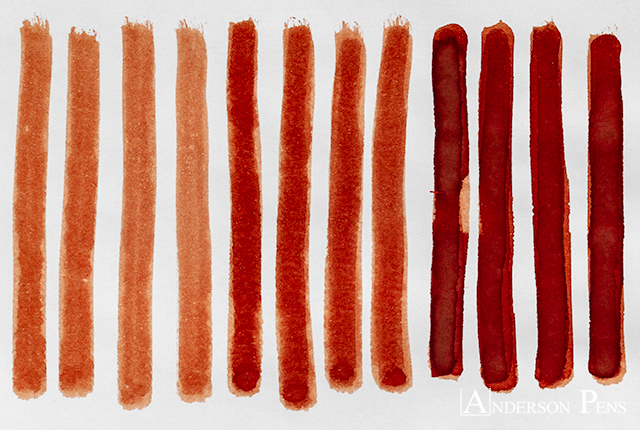 It is a moderately-saturated ink with good dry times at 15-25 seconds. The ink doesn’t have any water resistance, but that means clean up is easy. 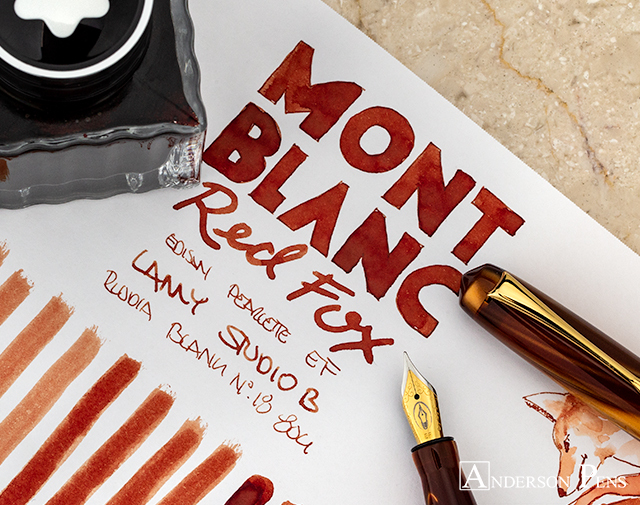 Limited edition Montblanc ink can be hit or miss – luckily, Red Fox is a real winner. The ink is a unique color that behaves wonderfully. The range of shading means even after extended use, the ink never gets boring. The color is playful and exciting without being too loud. 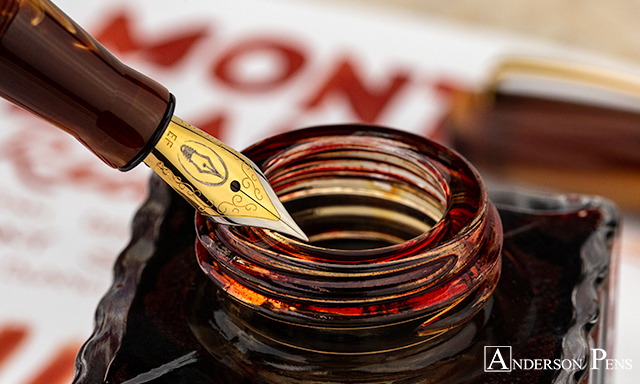 I’m a big fan of this ink, and while the price may seem high, it’s in line with the changing structure of the premium ink makers.